Sunday was National Fallen Firefighters Memorial Day. 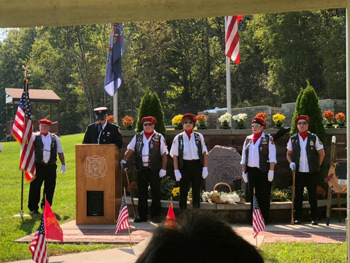 I attended a ceremony at the Washington County Fire Academy where fire departments from all over Washington County paid their respects to fallen firefighters in Pennsylvania, Ohio and West Virginia. We are fortunate to have brave men and women who run into danger and are willing to pay the ultimate sacrifice for our safety. Next week, I am partnering with Pennsylvania State Police Trooper Melinda Bonderanko and F.A.S.T. Center self-defense instructors, Tim Nease and Ryan Mechtel, to host a preventative program that empowers women by teaching awareness of their surroundings and what to do if they should find themselves in an unsafe situation.